Villa Parke was abustle before the clock struck ten. A line had formed. The Repair Cafe had about 35 volunteers ready for triaging, repairs, keeping order in the Really, Really Free Market and playing music. Someone brought in 64 tomato plants propagated lovingly from seed! 89 repair tickets were issued, and gleeful folks came in and left with rejuvenated appliances and clothing and newly sharpened tools and knives. 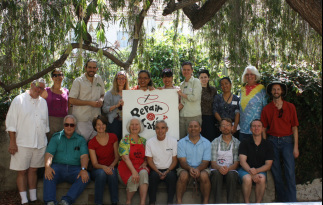 Repair Cafe is conceived as a project whose primary purpose is to build local community resilience. I was particularly thrilled to see a young man sitting with a seamstress who was teaching him to darn a sock. I saw a young woman learning to program something on her iPad, and I saw a woman having a heartfelt conversation while her earrings were being polished. 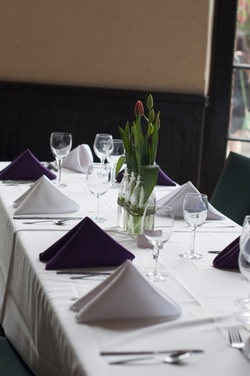 This kind of sharing and connecting holds immeasurable value. 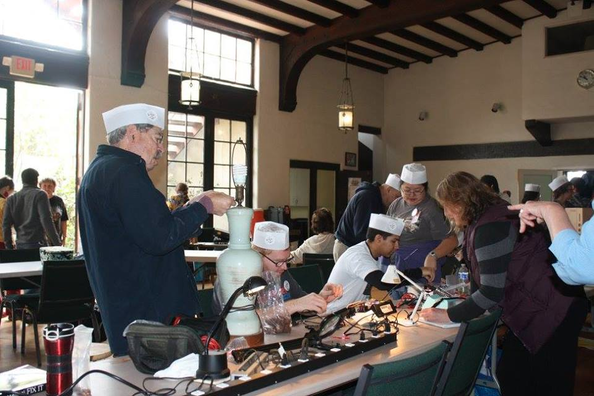 But the most wonderful fallout I experienced from this Repair Cafe came a couple days later. 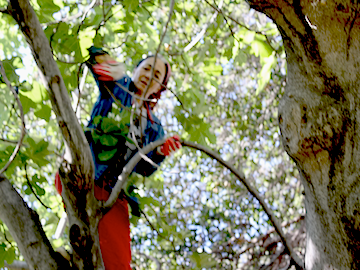 At the Arroyo Food Co-op, I ran into a seamstress who had done clothing repairs at recent events. Curiously, she was in the process of putting a box of plates, kitchen tools and clothing into a case in the store. 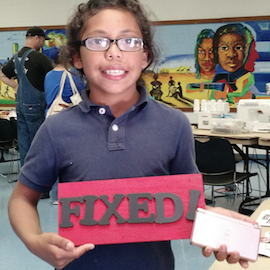 When I inquired what she was doing, she said she was seeding the new “Free Stuff case inspired by the Really, Really Free Market at Repair Cafe. She said this was all about the ripple effect and feeling a sense of abundance which she wanted to nurture within herself. She may not know the ripples of her actions. I trust one day she will. 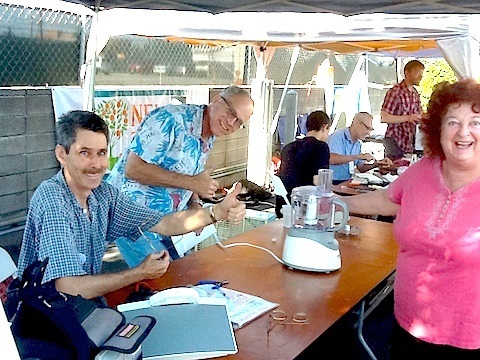 The marathon six-hour Repair Café at Pasadena Earth and Arts Festival on May 3rd had an unexpected outcome! 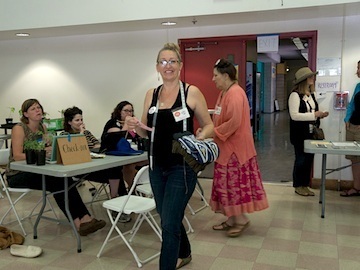 We know that most folks do not want to trot their appliances along with the kids for Earth and Arts Festival – although one woman did bring a very heavy sewing machine in on a trolley. We did 19 sewing and appliance repairs, and Jonathan was busy all afternoon at the bike repair station repairing about 6 bikes! 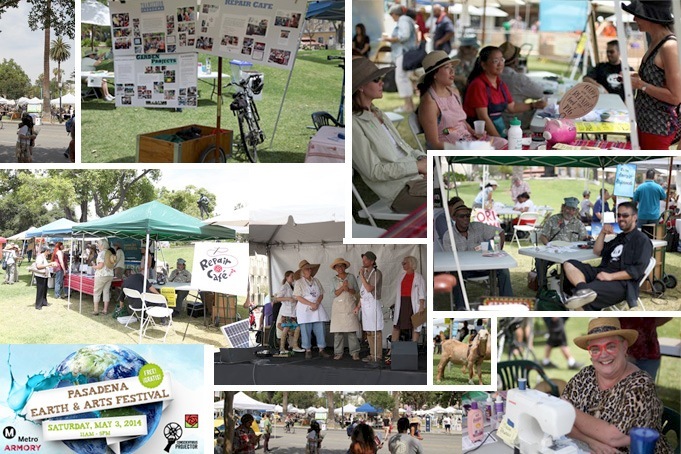 We attracted lots of attention with our solar sewing machine supported by Scoops' dresser-drawer solar battery setup. Passers-by loved his innovative contraption! They also loved our crisp new Transition Information Boards and the Cool Roofs info postcards. We garnered accolades from the stage manager, who invited Ginko, Scoops and Mary on stage to share the behind-the-scenes story of Repair Café. That was not the unexpected outcome, however. What was unexpected, was the hacker repair team bonding with each other, collaborating on the day's light workload – perfect for catching up with each other and enjoying the camaraderie and the refreshing breeze in Memorial Park. Beware fellas! 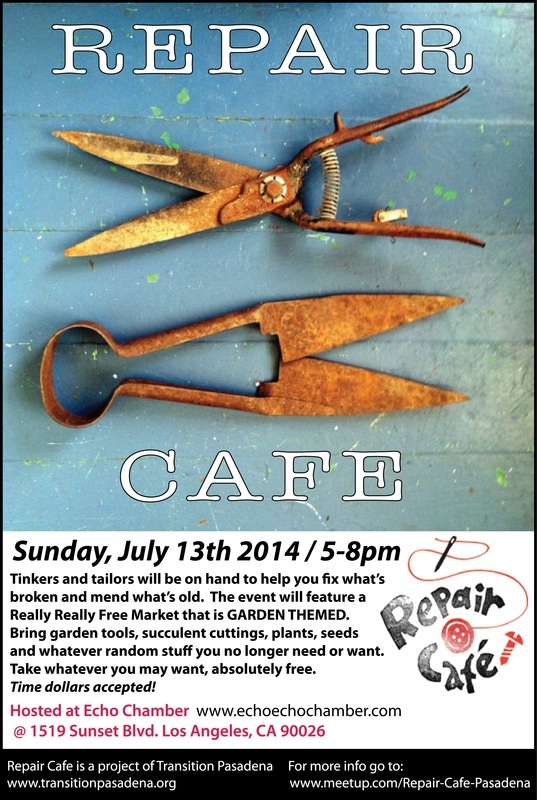 We handed out 100 flyers for the next Repair Café – June 14 at the Humane Society!